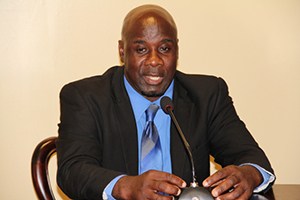 NIA CHARLESTOWN NEVIS (September 11, 2014) –Minister responsible for Public Utilities on Nevis Hon. Alexis Jeffers announced that the Nevis Electricity Company Ltd. (NEVLEC) had managed to clear up its debt of $7.8 million to Delta Petroleum, a company contracted to supply diesel and other lubricants to the electricity company. Mr. Jeffers made the announcement at a recent town hall meeting, hosted by the Nevis Island Administration at the Gingerland Secondary School Auditorium and stated that the island’s only power supplier had since been able to keep its payments current. “So we have paid Delta and we are trying our best to maintain our current standing with Delta as well,” he said. Meantime, Mr. Jeffers also commented on the status of an outstanding debt that the NIA had owed NEVLEC for its electricity supply to government offices. “If I can just touch on what was owed by the NIA to NEVLEC as of January 2013, we are looking at somewhere about $11.7 million. I can say to this point, we have brought that down to just about $7.6 million. “So we are going down. It’s not a huge drop or it’s not a huge chunk that has been taken off but as I said before, we are a government that believes in paying our bills,” he said. The Minister noted that the NIA believed it was important to settle its bills to persons who provided the government with goods and services. “We are not a government of hype. I think we can safely say we are a government that pays our bills because we believe in ensuring that the persons who provide us with goods and services, have to be paid because they have a staff to pay as well. They have to find the products to sell to NEVLEC at some point in time. So we have to provide the cash flow that they are looking for in terms of paying our bills to them,” he said. Mr. Jeffers also used the opportunity to commend Delta for the patience it had exercised with the NIA over the years. “We want to thank them for being patient with this government…because they would have had to be patient over the years, after running up a debt of $7.8million to their establishment. You must have had some patience to wait until you’re paid and I believe that we have done a good job in ensuring that they are paid and will continue to do so in the years to come,” he said.